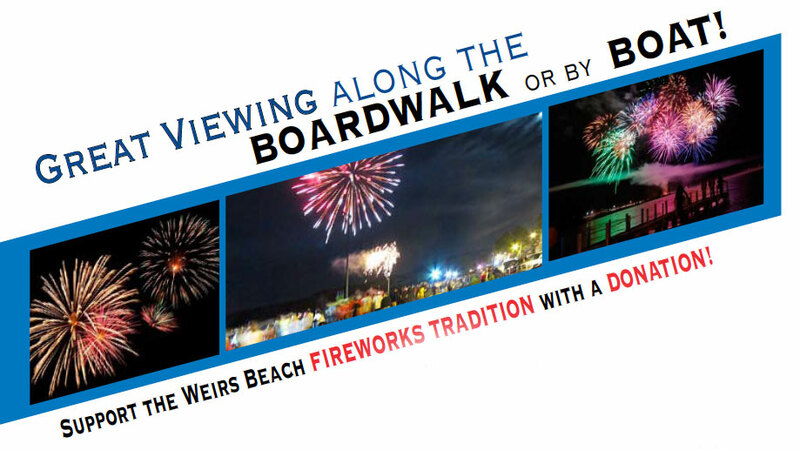 The Weirs Action Committee has once again taken on the pleasure of coordinating the summer tradition of Fireworks at Weirs Beach. This has been an important catalyst for family enjoyment. Families arrive early to look for just the right spot to enjoy the display, or to anchor their boats to utilize a great view from the lake. Arrive early for extra family fun: Enjoy mini-golf, arcades, bumper cars, dinner, ice cream, shopping, boat watching, fried dough & more. NEW THIS YEAR: All 2019 shows, except the July 4th show, will be shot from a barge. This will allow the general public to watch the show from anywhere on the beach! Bring your lawn chair and get comfortable for a fantastic show! Generous business and private sponsorships are instrumental in making our firework shows a tradition that continues bringing great summertime memories to our locals and visitors. Our regular shows cost between $3,000 - $4,000 per show! We are asking members of the Lakes Region community, business owners and visitors for your help with a financial commitment. Would you please consider a donation at a level of $50, $100, $250 or more? With your assistance, we can ensure that this event will continue to make Weirs Beach and the Lakes Region a destination for families. If you’ve ever experienced the display, you would surely agree that any contribution is worth it, to continue this area’s most spectacular tradition. If you have contributed in the past, please accept our thanks. We ask for your continued support for 2019. If you have yet to contribute, please join our effort.